Each year enterprising recorded music collectors are able to find the catalogue expanding with new repertoire by little-known composers. Sometimes it seems impossible that 'new' composers are still to be discovered. Certainly in the UK the net has been cast far and wide. How then that a composer of the worth and range and sheer volume of work as Leonard Salzedo still languishes in the realm of the relatively unknown? My guess is that private funding has not been found to promote or record his remarkably diverse and skilful body of work. That being the case all praise to the Archaeus Quartet for pretty much single-handedly promoting new recordings of his music. Trawling the current catalogue it appears that apart from a score for a Hammer Horror film and a disc of percussion music featuring Salzedo in part, the Archaeus' two discs centred on his string quartets are the only recordings available. Yet this is a composer whose output ran to 143 opus numbers, another 18 works without opus and another 18 film scores. The numbered works include 17 ballets, 2 symphonies, concerti for diverse instruments, the 10 string quartets (in part recorded here) as well as the late and intriguing sounding Opus 108 Requiem Sine Voxibus for Orchestra (1989). I strongly recommend the curious to read Paul Conway's excellent overview of the composer and his work elsewhere on MusicWeb - http://www.musicweb-international.com/Salzedo/. Conway also contributes the valuable liner for this new release. The Archaeus Quartet's previous disc recorded back in 2001 was released on Dutton - although with the same production team of Mike Purton producing and Tony Faulkner engineering. The Dutton disc included quartets No.2 & No.7 so with the three included here exactly half of Salzedo's output for quartet is now available. Curious that the Archaeus have not yet chosen to include either No.8 which was written for them or No.9 of which they gave the world premiere. One last little piece of house-keeping; the Archaeus Quartet have changed 2nd violin and cello since the earlier disc but the standard of the playing and the commitment to the composer remain very high indeed. It is worth touching briefly on Salzedo's career because it does impact on the effectiveness of his string writing and much of its style. He was born in London to parents with a Spanish/Sephardic Jewish background. He started to learn the violin at six and was composing by twelve. During the War he attended the Royal College of Music and had Herbert Howells as composition teacher. During his student years he wrote his first two string quartets - including the Op.1 recorded here. The Quartet No.2 so impressed Marie Rambert that she commissioned a ballet score from him and latterly became musical director of Ballet Rambert. Before that he spent some years in both the LPO - at the same time as Malcolm Arnold - and Beecham's RPO - becoming the latter's assistant conductor. He continued playing through to the mid-1960's which he gave up for the Rambert post mentioned before as well as other conducting roles before devoting himself solely to composition by the mid 1980's. For an Opus 1 Salzedo's quartet is an impressive work. Not least for the terseness and compressed use of material. No voluble and prolix piece this. At just thirteen minutes long and in a single movement the twenty one year old composer wastes no time or material on empty rhetorical gestures. The piece won the famous Cobbett Prize for composition in 1942 although it is not clear whether the chosen single-movement form is a consequence of Salzedo entering the competition or not. What is immediately clear is the Bachian influence with Salzedo seeking a style of contrapuntal writing that pays immediate and obvious homage to the baroque master. There is a certain austerity here as well that is a common factor across all three works. Salzedo is not writing music of emotional or musical lushness. 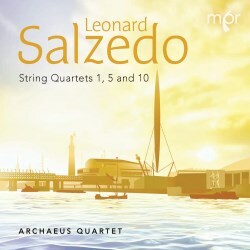 That powerful emotions are on display is clear - the String Quartet No.5 that follows is rent with striking musical gestures - but Salzedo does not seek the overtly lyrical/pastoral aspect of writing for strings. This is reinforced by both the playing and engineering of the disc. The Archaeus Quartet do not project the sweetest of collective sounds nor is the church venue recording particularly warm or resonant. The engineering of the disc is good and produces a well-defined soundstage but without glamourising the individual instruments. It is left to both the performance and indeed the music draws the listener in through the power of its argument. No real surprise that this Op.1 is the least individual and compelling of the three works offered here but what does impress is how effectively Salzedo writes for the whole ensemble both individually and collectively. Also, there are elements to the melodic shapes he creates that point forward to the later works. His themes often have an unmistakeably Jewish/Moorish flavour that acknowledges his ancestral roots. The way in which he will place one of these swaying melodic lines over a relatively simple hypnotic bass figuration places this music well away from the usual British style of the mid 20th Century [track 1 - 4:00]. This is much more marked in the later works but the basis of the idea is formed here. Interesting to make a direct comparison with Malcolm Arnold's student quartet Vita Abundans which was also written for the Cobbett competition the previous year. Again this is a remarkably fluent and confident work for a student piece but hard not to hear the Arnold as more flippant albeit great fun too. The Salzedo is a consciously knottier work. The progression from the Op.1 of 1942 and the Op.32 String Quartet No.5 of 1950-2 is marked. The work was revised in 1995 but the liner does not make clear the scale of the revision. However Conway notes that Salzedo believed it to be one of his finest works and he describes it as "one of the composer's most wide-ranging and deeply personal utterances." Even at a first listen this comes across as a very powerful and impressive work. Again concision is key and the initial music unfurls from a simple unison cell. The difference is the confident handling of this material and the expressive range Salzedo achieves. Conway notes how Salzedo uses the full gamut of string techniques but these serve the music rather being simply 'effects'. Likewise his melodic lines are markedly sinuous and feature many quarter tone 'bends' into notes all of which are played with great aplomb especially by leader Ann Hooley. The Archaeus Quartet are very good at projecting the sinewy muscularity of these scores - I did occasionally wonder whether this could be juxtaposed with passages where they did allow their collective sound to sweeten and the sinew could become more sultry and sensual. The piece itself is written in two movements, each one of which is divided into distinct sub-sections. The expressive range across this sub twenty-five minute work is remarkable and all the more so for the way Salzedo coheres the music together. Conway points out the way Salzedo uses dance rhythms allied to melodies of a distinctly middle-eastern/Sephardic flavour which alongside an improvisatory character gives the music a quite unique style. The final five minutes of the quartet build a climax a wonderfully frenzied climax with stamping bass rhythms supporting an ever-more frenetic wild dance in the first violin before one final gesture of dismissal. This really is a very fine quartet played with exactly the requisite fervour. Certainly its relative neglect is unfathomable and if you respond to similar works by Frankel, Leighton or Daniel Jones this demands to be heard. Salzedo's musical language is tonally centred but using high levels of dissonance and also sourcing elements of other cultures that is probably more common today than it was at the time of its writing. For his final essay in the genre Salzedo returned to a single movement form for his 10th String Quartet. The musical language and the rhythmic energy are very similar to the 5th proving that the composer's energy and dynamic style was undimmed although the works were written over forty years apart. The quartet was written in 1997, the year Salzedo gave up composing through increasing ill-health - it carries the opus 140 of the total of 143 - but this is no work tinged by intimations of mortality. The compositional technique is ever more refined but in fact the momentum and thrust of the work is what impresses from the opening perpetuum mobile - a hint of Shostakovich out of Ginastera perhaps - through to the closing pages of high energy dissonance. To quote Conway once more; "the bravura closing bars are a fittingly triumphant and celebratory conclusion to one of the most individual and searching string quartet cycles in twentieth-century British music". That strikes me as exactly right. Again the Archaeus Quartet provide a performance of searing commitment. Indeed, commitment is very much the watchword of this entire disc - it is clearly a labour of love. The label is producer Mike Purton's own, the liner is beautifully produced; well-illustrated as well as informative and printed on high quality paper. Purton contributes a personal note making clear his own friendship with Salzedo which goes back over many years. Both for the quality of the music it promotes and the excellence of the technical and musical presentation this disc deserves every success. Also mentioned in the liner is the work and support of The Leonard Salzedo Society. I hope very much that this disc will be the first of many more to showcase the brilliance of one of Britain's most underrated but individual composers.